Waikiki Spam Jam Celebrates a Hawaii Cullinary Classic for Charity. 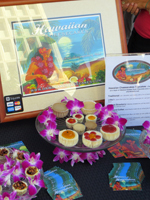 Waikiki Spam Jam Celebrates a Hawaii Culinary Classic! I don’t usually go to the Waikiki Spam Jam because it’s almost always scheduled for the same day and time as my son’s birthday party – the last Saturday in April. I like my son better than I like crowds and Spam®, so it’s never a difficult choice which event I should attend. 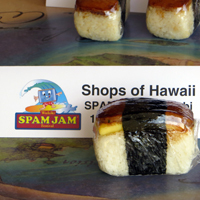 But since my son probably won’t invite you to his birthday party, you might want to check out the Waikiki Spam Jam. In general, I try to avoid crowds. As a result, Hawaii festivals aren’t my favorite activities in Hawaii. They all have food vendors. They have product vendors. And they have free live entertainment. Done one... done ‘em all (just my introverted opinion). 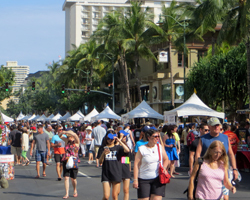 Nevertheless, judging by the number of festivals in Hawaii and the size of crowds they draw, I’d have to admit that a lot of other people really enjoy Hawaii fun activities such as the Waikiki Spam Jam. This event draws an estimated 25,000 visitors and local residents! Why? Admission is free! They have tasty local foods! They have cool local products and crafts! And they have talented local performers doing free Waikiki entertainment! What’s not to like!? In years past, canned meats were logistically easier to ship to Hawaii. Spam® just works with rice (the staple starch in Hawaii). Whereas I can’t imagine eating Spam® with most mainland food. 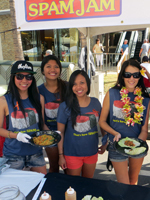 Thus, Waikiki's signature food festival is dedicated to that cube of meat we all like to eat! Some of Hawaii’s top restaurants and food vendors unveil special Spam® treats, from the expected (musubi: a local favorite) to the unusual (Spam® cheesecake), and everything in between! There’s also a ton of Spam® merchandise, such as T-shirts and water bottles, some of which is actually quite nicely designed. Finally, proceeds from the Spam Jam go to benefit the Hawaii Foodbank – Hawaii’s largest charity and a recipient/distributor of thousands of donated cans of Spam® every year! 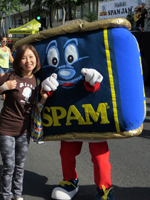 If you’re in Hawaii at the end of April, you might as well check out the Waikiki Spam Jam. It’s one of several free things to do in Waikiki, which helps you stick to your travel budget; and you’ll probably have a tasty good time!